As part of the planned work on the East Don portion of the Toronto Trails Plan, the City of Toronto and Toronto and Region Conservation are hosting an open house from 6:00-8:30 p.m. on Wednesday, February 13, 2013 at Blessed John 23rd Catholic School (175 Grenoble Drive, near Don Mills Rd. & Overlea Blvd.). The proposed East Don Trail will run from near the Forks of the Don in E.T. Seton Park to the Gatineau Hydro Corridor near Victoria Park and Eglinton Aves. This is an important link in Toronto’s trail system that will fill the biggest gap in an off-road bike route that connects downtown to northeast Scarborough. The city wants your feedback for the Environmental Assessment and we encourage all area cyclists to attend the open house. 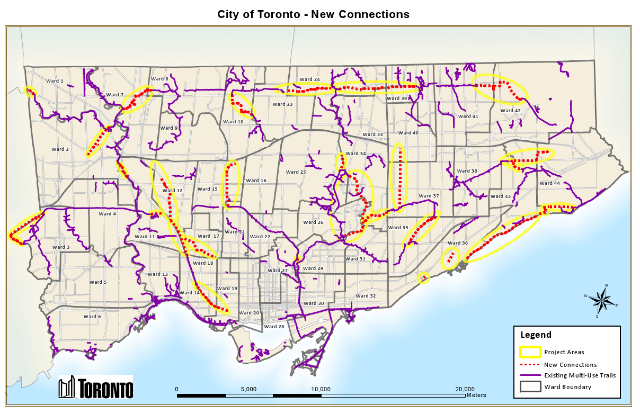 The City of Toronto is hosting a public meeting on Monday, February 6, 2012 where staff will present their recommendations for additions to the city’s off-road cycling network. Although none of the proposed routes are in Ward 29, a number of them do plug gaps in the Don Valley trail system or make connections to other routes like the Gatineau Hydro Corridor. Staff’s final report will be submitted to the Public Works and Infrastructure Committee in March, and for final approval by City Council after that. We encourage all interested cyclists to attend the meeting on Monday evening to examine the planned improvements and talk to staff. Ward 29 Bikes representatives will be attending; look us up if you’re there. Who: City of Toronto Staff and you! Map from the City of Toronto website.